"Let your clothing work for you!" 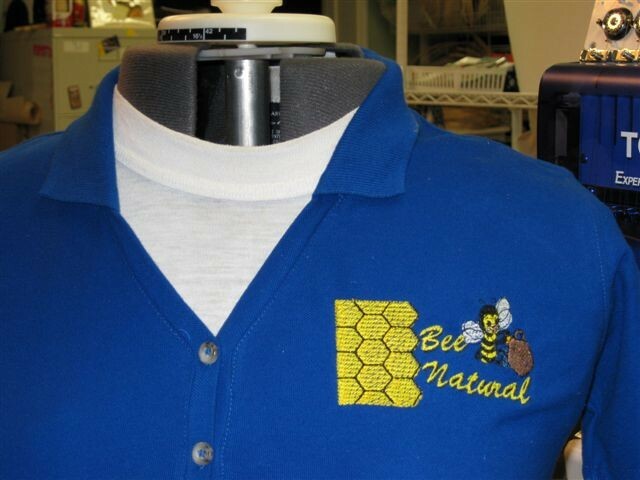 Identify your company (business) or club with embroidery for everyday wear or a special event. I specialize in small quantities and most clients supply their own shirts and hats to be embroidered. Simple digitizing is done in house for a small fee. Complex designs are sent out with your approval and paid for by the client. Embroidery pricing is based on stitch count. Monogramming is making a come back. Put your initial on towels, linens, purses, tote bags,pillows,pillowcases, and kitchen items. Choose from script or block lettering in round or diamond shape and add flourishes. Make your monograms as unique as you are. Embroidered monograms make everyday items special for children, too. Names and initials can be embroidered on clothing, bedding,backpacks,hats and many other items. Names aren't just for people, animals of all kinds like to wear their names. Some examples that can be embroidered are blankets, bandannas, leads, and doggie apparel. This shirt was digitized from a business card and then embroidered on a shirt.